Expansion by Mexican LCC group Volaris in the Central America-US market is being held up by an objection from its former partner, Southwest Airlines. The business plan for Volaris’ new Costa Rican subsidiary relies heavily on the US market, with up to eight US destinations from Costa Rica and other Central American countries. Volaris Costa Rica has been aiming to launch services to the US in Sep-2017, starting with flights to Houston and Los Angeles, but has not yet secured approval from US authorities. Southwest, which partnered with Volaris in 2010 to 2013 by offering connecting itineraries, has raised objections and is urging the DOT not to award Volaris Costa Rica an exception to foreign airline ownership regulations. The ramifications of the DOT ruling are significant for both Volaris Costa Rica and the overall Central American market. Central American countries have long complained about a lack of service and high fares, including to the US – which accounts for nearly half of the region’s passenger traffic. CAPA will hold its inaugural Latin America Aviation Summit in Cartagena, Colombia, on 11/12 September 2017. Volaris Costa Rica launched services in Dec-2016 and currently operates five routes within Central America using a fleet of two A320s. As CAPA highlighted in a 14-Jul-2017 analysis report, Volaris Costa Rica is providing the only LCC option on all five of its routes and Volaris is now the largest Latin American LCC group in the Central American market. The launch of Volaris Costa Rica enables the Volaris group to pursue opportunities in the underserved Central American market, which has an LCC penetration rate of only 8% compared to nearly 50% in Mexico. Volaris currently has more than 12,000 weekly seats in the Central American market, including nearly 6,500 seats within Central America and over 5,700 seats on routes from Mexico to Central America. Central America has become a focus area as Volaris tries to reduce its reliance on the Mexican domestic and Mexico-US markets. Of the 7.1 million passengers that the group carried in 1H2017, 80% were in the Mexican domestic market, approximately 18% were in the US-Mexico market, and between 1% and 2% were in the Central American market. Volaris continues to expand in the Mexico domestic and Mexico-US markets. However, as CAPA studied in a separate recent report, the group’s expansion in the Mexico-US market is now focusing less on its traditional staple – the northbound VFR segment – as it launches new US routes from Mexican beach destinations and from Mexico City. Pursuing growth in new segments of the Mexico-US market and launching Volaris Costa Rica provides platforms to diversify the group’s business as it continues to expand rapidly. Volaris reported a 16.7% increase in capacity (ASMs or ASKs) for 1H2017. The group has grown capacity at an annual rate of at least 9% for at least five consecutive years. International ASKs grew by 31.2% in 1H2017, driven by new US routes and the launch of Volaris Costa Rica, while domestic ASKs grew by a more modest 10.6%. International capacity has grown at a faster rate than domestic capacity since 2014, and this trend will likely continue given the group’s expansion plans for the Central America and Mexico-US market. Volaris has no plans, at least for the time being, to launch services to South America. It also has no aspirations to add a widebody long haul operation. Volaris will continue to grow system-wide capacity at a double-digit rate as it expands and upgauges all of its A320 family fleet. Volaris ended 1H2017 with a fleet of 66 aircraft, made up of 12 A319ceos, 43 A320ceos, one A320neo, and 10 A321ceos. This includes two A320ceos that have been subleased to Volaris Costa Rica, and 64 aircraft under the Mexican operator's certificate. The group plans to end 2017 with a fleet of 73 aircraft, as five A320neos and one A321neo are delivered. One of these A320neos – the group’s second A320neo overall – has already been delivered, in early Jul-2017, giving the group a fleet of 67 aircraft (including the two in Costa Rica). Volaris plans to expand the fleet by another six aircraft in 2018, to 79 aircraft, and capacity will grow at even faster rate as five of its 12 A319s are phased out. The airline expects to take delivery of 13 aircraft in 2018 (eight A320neos and five A321neo), with seven aircraft allocated to replace smaller A319s and six aircraft allocated purely for growth. Volaris’ A320neos have 186 seats, while its A321neos will have 230 seats – representing a 29% and 60% increase in capacity, respectively, compared to the 144-seat A319s. The upgauging enables Volaris to add capacity on existing domestic Mexico and US routes. The A321neo also enables Volaris to maximise its slots at Mexico City, where there are infrastructure constraints, and reduce its already low unit costs. The group’s A320neos and A321neos are not intended for the new Central American operation. Volaris has so far transferred two A320ceos to Volaris Costa Rica and is considering the transfer of one of its remaining A319ceos to Costa Rica by the end of 2017. The A319 is a better fit for thinner routes within Central America, as well as for some of Volaris Costa Rica’s planned US routes. All of the airline’s initial routes are operated less than daily, and so far Volaris Costa Rica’s load factor has been well below the group’s typical 80% plus load factor. The expansion of the Volaris Costa Rica fleet to three aircraft in 2H2017 hinges on the airline securing approval to serve the US. Volaris Costa Rica will also need US approval to continue expanding its fleet in 2018 and beyond. The business plan for Volaris Costa Rica envisages the fleet eventually growing to 18 to 22 aircraft. However, without US approval the airline may only be able to support half as many aircraft, which would limit its ability to build up an economy of scale. The US is a critical market for Volaris Costa Rica: the US accounts for 45% of total international capacity from Costa Rica, making it larger than the intra-Central American market which Volaris is already serving. The US-Costa Rica is a relatively large market, consisting of nearly 3 million annual passengers. However, Volaris believes it is underserved and suffers from high average fares. Volaris aims to stimulate demand by offering lower fares than US airlines, which now dominate the market. Volaris Costa Rica also plans to serve the US from other Central American countries. These are smaller but sizeable markets with very limited LCC options. Volaris should be able to stimulate demand in the El Salvador, Guatemala, Honduras and Nicaragua to US markets – provided it can secure approval from the US DOT. In Mar-2017 Volaris Costa Rica submitted an application with the US DOT for a foreign air carrier permit and exemption. Volaris Costa Rica needs an exemption as it is wholly owned by Volaris' group parent Controladora, which is publicly traded with listings in Mexico City and New York. Volaris Costa Rica initially aimed to launch services to the US in Sep-2017, starting with flights from San Jose to Houston and Los Angeles. However, the approval process has been slowed down by an objection from Southwest Airlines, which is the largest existing LCC in the Costa Rica-US market. Southwest is arguing that Volaris Costa Rica should not be awarded an exemption to ownership regulations because it is a start-up airline. Southwest is also claiming that Volaris Costa Rica is managed by Volaris in Mexico, and therefore does not meet regulations governing control of foreign airlines. Volaris Costa Rica responded by refuting Southwest’s claims that its two Costa Rican board members are not active and the airline is managed from Mexico. The airline is led by a former TACA Costa Rica executive, who is a Costa Rican citizen and serves as Volaris Costa Rica’s general manager and chairman. “The carrier has a Costa Rican management team, and a Board of Directors that is controlled by Costa Rican citizens”, Volaris Costa Rica stated. Volaris Costa Rica has pointed out that several Latin American airlines are authorised to serve the US, although they do not have majority local ownership. In some cases they do not have any local ownership, similarly to Volaris Costa Rica. Avianca Costa Rica, which was previously known as LACSA, is the most relevant example. LACSA was able to continue operating services to the US after it became part of the Colombia-based Avianca group in 2010. The Avianca group does not currently operate services from Costa Rica to the US but is still operating services from El Salvador, Guatemala, Honduras and Nicaragua to the US (according to OAG data). Other airlines in the Avianca and LATAM groups, as well as Copa Colombia, also have exemptions permitting services to the US, despite not meeting airline ownership regulations. Southwest argues that these cases are different, and the DOT has never provided an exemption to a new airline. Southwest’s position is Volaris Costa Rica’s proposed routes from San Jose to Houston and Los Angeles constitute seventh freedom services under Volaris in Mexico. Such rights are not available under the Mexico-US or Costa Rica-US air services agreements. The US DOT should be making a determination within the next few months on whether Volaris Costa Rica qualifies for an exemption. A lot is at stake, given the heavy reliance the Volaris Costa Rica business plan has placed on the US market. There are also potentially wider implications of the US DOT’s decision, because an exemption for Volaris Costa Rica could persuade other LCC groups in Latin America to establish wholly owned subsidiaries in other countries. Volaris Costa Rica has identified eight potential destinations in the US. In addition to Houston and Los Angeles, the airline is evaluating services to Chicago, Dallas, Miami, New York, Orlando and San Antonio. These are all destinations already served by Volaris from Mexico. Volaris Costa Rica has also included Mexico, the Caribbean and the northern part of South America in its long term network plan. However, its focus (at least for the time being) is on the intra-Central America and US markets. The Volaris group overall is focused on North America and Central America, where it believes there are ample opportunities for expansion. Volaris Costa Rica’s network is currently limited to four destinations in Central America – San Jose in Costa Rica, Guatemala City in Guatemala, Managua in Nicaragua and San Salvador in El Salvador. The first priority is to connect the dots between these four cities, and potentially one or two cities in Honduras, and launch services to destinations in the US that are already served by Volaris from Mexico. Managua and San Salvador are new destinations for the Volaris group that are only served by Volaris Costa Rica. Guatemala City and San Jose are also served by Volaris in Mexico. Although Volaris Costa Rica uses the same website as Volaris Mexico, connecting itineraries are not yet sold. Volaris Costa Rica, at least for now, is entirely focused on the point-to-point market. Regional destinations within Central America and the US are the main target, as they are the biggest local markets from Costa Rica and other Central American points. South America routes would likely require feed from Mexico, which could be arranged in a later phase but is not the current priority. As a Costa Rican certified airline, Volaris Costa Rica has the ability to operate from other countries in the Central American Common Market (CACM). In addition to Costa Rica, other CACM countries are Guatemala, El Salvador, Honduras and Nicaragua. These five countries are essentially a single aviation market, enabling airlines from any country to operate between any two members countries and from any member country to countries outside the region (as long as this is permitted by the relevant air services agreement with the country outside the region). Volaris Costa Rica is already operating two routes within Central America that do not touch Costa Rica and plans to operate its US routes from both Costa Rica and other Central American countries. The airline has not specified a routing for its proposed Houston and Los Angeles services but stated in its application with the US DOT that the flights may be operated nonstop from San Jose or via intermediate points in Central America. Volaris is keen to serve the US from the other CACM countries because most Central American immigrants in the US are from El Salvador, Guatemala and Honduras. There are less than 100,000 Costa Ricans living in the US, compared to more than 1.2 million El Salvadorans, nearly 1 million Guatemalans, more than 500,000 Hondurans and more than 200,000 Nicaraguans. Los Angeles has the largest Central American community in the US, with more than 500,000 Central American immigrants. Houston is the fifth largest – behind New York, Washington DC and Miami – but is growing. The Los Angeles-Central America market is not served by any LCCs, making it particularly attractive to Volaris. Avianca and Delta Air Lines are the only airlines that currently operate nonstop flights from Los Angeles to both San Salvador and Guatemala City. Delta and Alaska are the only airlines now operating to San Jose from Los Angeles. There are currently no services from Los Angeles to the other two CACM countries – Honduras and Nicaragua. Delta previously operated from Los Angeles to Managua, but this route was suspended in Aug-2016. Outside the CACM region but in Central America, there are flights from Los Angeles to Panama City on Copa and seasonal flights from Los Angeles to Belize City on American and Delta. The Belize flights cater to US southbound leisure traffic while Copa offers connections throughout Central America, including the five CACM markets. Houston is served from all the CACM countries except Nicaragua. United dropped Managua in 2013, but still links Houston Intercontinental with six destinations in CACM, being Guatemala City, Liberia (Costa Rica), San Jose, San Pedro Sula (Honduras), San Salvador and Tegucigalpa (Honduras). Spirit also operates from Houston Intercontinental to San Pedro Sula, and Avianca serves Houston from San Salvador. Southwest competes in the Houston to Liberia and San Jose markets using its hub at Houston Hobby Airport. Volaris Costa Rica therefore would become the second LCC after Southwest in the San Jose-Houston market. However, Volaris Costa Rica would cater to a different segment of the market as it operates under a ULCC point-to-point business model. Southwest is a network airline, offering connections beyond Houston, and follows more of a hybrid model, with complimentary checked bags, snacks and drinks. Volaris Costa Rica could also decide to stop its Houston flight in Guatemala City or San Salvador – markets where there are currently no LCC options. Of the five US-CACM markets, Costa Rica is the largest but consists primarily of southbound leisure passengers. More than 70% of Costa Rica-US traffic originates in the US. 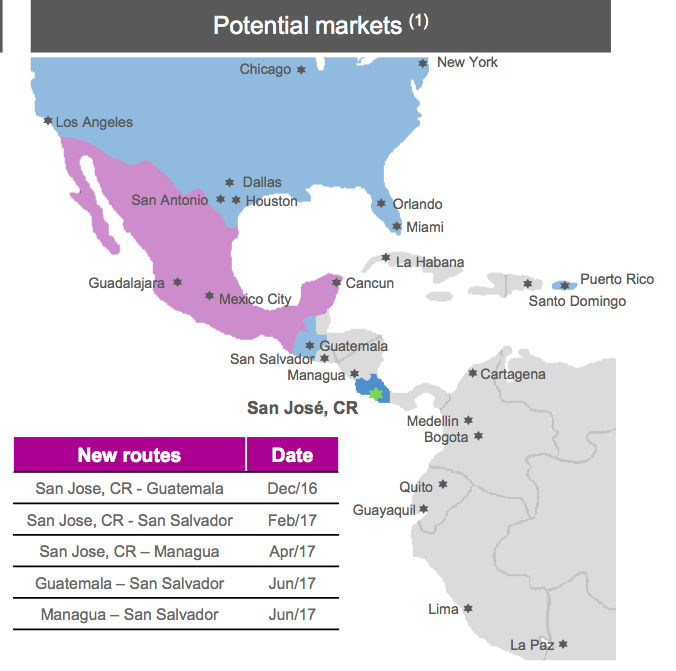 Volaris’ US operation has always focused on northbound VFR traffic but Volaris is keen to expand in the southbound segment of both the Mexico-US and Costa Rica-US markets. In Costa Rica, Volaris believes there are opportunities to stimulate demand to and from the US. However, stimulating demand from other Central American countries may be easier, given the more intense competition from US airlines in the Costa Rica market and the fact that Volaris is not a well known brand among US consumers. Virtually all of Volaris Costa Rica’s potential US markets have competition from US airlines. San Jose is currently served from 12 US airports with 45,000 weekly seats (based on CAPA and OAG data for the week commencing 17-Jul-2017). United is the leader, with nearly 13,000 seats, followed by American with 11,000 weekly seats. Alaska, Delta, JetBlue, Spirit and Southwest also serve San Jose. Nearly 40% of the international seat capacity at San Jose is in the US market. Liberia, a popular resort destination on Costa Rica’s Pacific coast, is also currently served from 12 US airports. Liberia has 18,000 weekly seats to the US, which accounts for almost 90% of the airport’s total international seat capacity. Liberia is currently served by American, Delta, JetBlue, Southwest and United; Sun Country also has seasonal service. Overall the Costa Rica-US market currently has over 30,000 weekly one-way seats. Capacity decreases to approximately 20,000 seats during the off-peak months of September and October, but increases to nearly 50,000 during the peak Christmas period. LCCs currently account for approximately a 25% share of Costa Rica-US capacity, led by Southwest with a 10% share. Southwest operates four routes to Costa Rica, connecting Baltimore/Washington and Houston Hobby with both Liberia and San Jose. Southwest is not likely to enter other Central American markets, given its focus on US outbound traffic. JetBlue, which serves Liberia from New York and San Jose from Orlando, has a similar focus with its international operation. Spirit has traditionally been more focused on the northbound ethnic and VFR segment of the Latin America-US market. Spirit serves San Jose from Fort Lauderdale and is also now the only LCC serving the US to El Salvador, Guatemala, Honduras and Nicaragua markets. However, Spirit has a relatively limited amount of capacity in these four markets. All of its Central American routes except for Fort Lauderdale-San Jose are served less than daily. All of Spirit’s Central American destinations are only served from Fort Lauderdale with the exception of Honduras, which is also served from Houston. The US to the El Salvador, Guatemala, Honduras and Nicaragua markets are therefore underpenetrated by LCCs. Avianca is the market leader in the El Salvador-US market and also has services from Guatemala, Honduras and Nicaragua to the US. Avianca has eight US routes from its main Central American hub in San Salvador: (in order of seat capacity) Los Angeles, Washington Dulles, New York JFK, San Francisco, Miami, Houston, Chicago and Dallas. San Salvador is also served by American (from Dallas and Miami), Delta (from Atlanta and Los Angeles), United (from Houston and Newark) and Spirit (from Fort Lauderdale). The four US airlines have only approximately 9,000 weekly one-way seats in the El Salvador-US market, compared to more than 13,000 seats for Avianca. The US accounts for almost 40% of international seat capacity from El Salvador. San Salvador has approximately 50% less US capacity than Costa Rica, although during certain times of the year the gap is only 15%. Guatemala is 50% smaller than El Salvador, with approximately 15,000 weekly one-way seats, followed by Honduras with 13,000 weekly one-way seats, and Nicaragua with 10,000 weekly one-way seats (based on OAG schedules for the week commencing 17-Jul-2017). Avianca has just two US routes from Guatemala – to Los Angeles and Miami. American, Delta, United and Spirit also serve Guatemala. American, which has four routes to Guatemala, is the larger airline presence in the Guatemala-US market. Over 40% of Guatemala’s international seat capacity is to the US. Honduras has an even a larger concentration of capacity to the US, at slightly over 50%. The US-Honduras market is split up, with Avianca, American, Spirit and United serving San Pedro Sula, and American, Delta and United serving Tegucigalpa. Avianca, American, Delta, United and Spirit also compete in the Nicaragua-US market. Avianca only links Managua with Miami, while American, the market leader, serves Managua from both Miami and Dallas. The US accounts for five of Managua’s 12 international destinations and nearly 50% of its international seat capacity. Volaris not being permitted by the US DOT to enter any of the CACM-US markets would be disappointing as they could all benefit from more LCC capacity and lower fares. El Salvador, Guatemala, Honduras and Nicaragua are particularly underserved and have not had a significant increase in capacity for several years. Costa Rica has experienced an influx of additional capacity, driven partially by Southwest (which entered the market in 2015), but could potentially support even more capacity given its rising popularity as a holiday destination for Americans. Volaris is well positioned to stimulate demand in the CACM-US market given its ultra low cost business model and familiarity with the Central American market. Several Volaris executives, include CEO Enrique Beltranena, previously worked at TACA when the group was still independent. Since the merger with TACA, Avianca has cut back in Central America, particularly Costa Rica, leaving a void that is ideally suited for an LCC. Without the ability to operate to the US, Volaris Costa Rica may not have a viable business case. Central America needs Volaris to reduce fares, stimulate growth and boost the overall economy. It would be a shame if the US government got in its way.